WASHINGTON — The United States could strike North Korea if it attacks a U.S. military base or tests an intercontinental ballistic missile, President Donald Trump’s U.N. ambassador said Monday. In several television interviews, Nikki Haley praised China’s involvement in trying to pressure North Korea to cease missile testing and criticized Pyongyang’s leader, Kim Jong Un, as unstable and paranoid. The Trump administration has been working to rally support behind its efforts to pressure Pyongyang into abandoning its nuclear program and ending missile tests. Trump spoke again to the leaders of China and Japan late Sunday to discuss the matter. The White House said in a brief statement Monday that Trump and Chinese President Xi Jinping reaffirmed the “urgency of the threat posed by North Korea.” Trump has repeatedly promised that China will earn a better trade deal with the U.S. if it helps to exert pressure on its allied neighboring nation. Vice President Mike Pence in a visit to the DMZ and South Korean capital vowed action to achieve a nuclear-free peninsula, saying the U.S. and its allies will act unless China uses its influence to rein in North Korea. Meanwhile, a North Korean ambassador took a defiant tone at the United Nations. Chief foreign affairs correspondent Margaret Warner reports. North Korea has been aggressively pursuing a decades-long goal of putting a nuclear warhead on an intercontinental ballistic missile, or ICBM, capable of reaching the U.S. mainland. North Korea conducted two nuclear tests last year alone, which would have improved its knowledge on making nuclear weapons small enough to fit on long-range missiles. South Korean officials say there’s a chance the country will conduct its sixth nuclear test or its maiden test launch of an ICBM around the founding anniversary of its military on Tuesday. Haley said the U.S. is working with China to pressure North Korea on the missile and nuclear testing and other issues, including the detention over the weekend of a U.S. citizen, bringing to three the number of Americans now being held there. 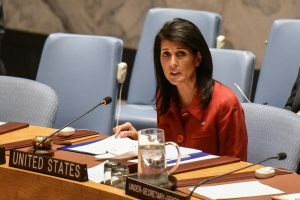 Haley said the detentions are North Korea’s effort to “have a bargaining chip” for talks with the U.S.